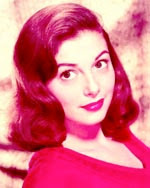 Here is another wonderful song by the divine Edda Dell'Orso, chosen to illustrate the beauty of the lovely Italian star Pier Angeli. 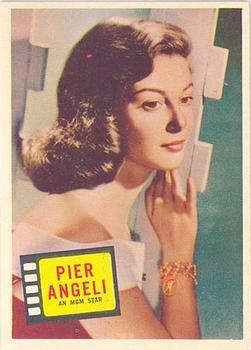 Pier Angeli (born Anna Maria Pierangeli) (1932 – 1971) was born in Cagliari, Sardinia, Italy, and made her film debut with Vittorio de Sica in "Domani è troppo tardi" (1950). 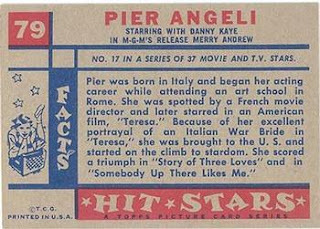 She was discovered by Hollywood, and MGM launched her in her first American film, "Teresa" (1951). Enthusiastic reviews for her eloquent and understated performance compared her to Garbo. Under contract with MGM throughout the 1950's, she appeared in a series of films. In "The Light Touch" with Stewart Granger, she indeed brought a light touch of innocence to the film. Her next few films were: "The Story of Three Loves" (1953) with Kirk Douglas, "Sombrero", in which she replaced an indisposed Ava Gardner, and "Flame and the Flesh" (1954), where she lost her man to Lana Turner. Meanwhile, MGM having discovered Leslie Caron, Angeli found herself loaned out to other studios. She went to Warner Bros. for "The Silver Chalice", which marked the debut of Paul Newman, and made "Mam'zelle Nitouche" with the great Fernandel. For Paramount, she should have had the role of Anna Magnani's daughter in "The Rose Tattoo", but motherhood having interfered, it went to her twin sister, Marisa Pavan. She was loaned out again, to Columbia, for "Port Afrique" (1956). She showed a return to her old form when she returned to MGM for "Somebody Up There Likes Me" as Paul Newman's long-suffering wife. She still appeared in "The Vintage " (1957) with Mel Ferrer and John Kerr, and in "Merry Andrew", starring Danny Kaye. During the 1960's and until 1970 the actress returned to live and work in Britain and Europe. She made a strong performance opposite Richard Attenborough in "The Angry Silence" (1960). She was reunited with Stewart Granger for "Sodom and Gomorrah" (1963). She played a brief role in the war epic "Battle of the Bulge" (1965). She was picked to play a role in "The Godfather", but she died soon before. Kirk Douglas and Angeli were engaged in 1950's, according to Douglas' autobiography. 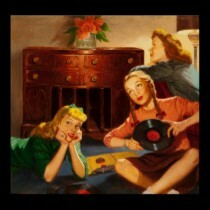 For a short time Angeli also had a close relationship with James Dean. However, she broke it off suddenly and went on to marry singer/actor Vic Damone (1954-1959). Her second marriage was to Italian composer Armando Trovajoli (1963-1965).